One of the most frequent questions I get is, "How do you align your fins?" I've cut fin templates out of foam core and the results were extraordinary. It's also a lot of work. The question is, is there an easier way? I have a technique that is fairly simple, has minimal hardware requirements and provides pretty decent results. 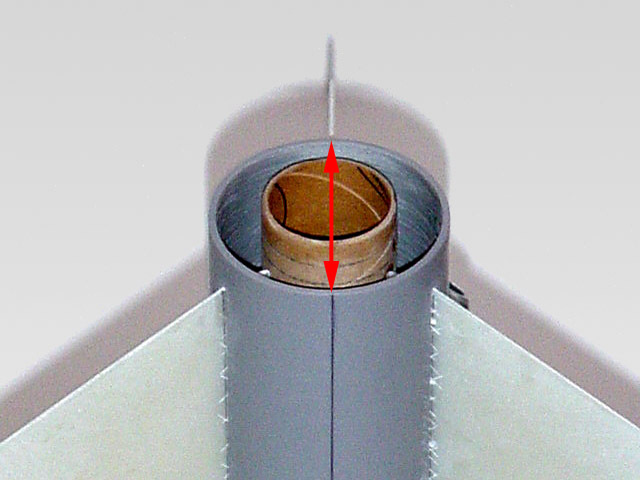 Apply your adhesive of choice to the root edge of the fin. I typically tack the fins with a couple of drops of CA. Tip : On Quantum Tube you can use a fine point Sharpie to draw you lines. When you're finished, you can wipe the lines away with alcohol. 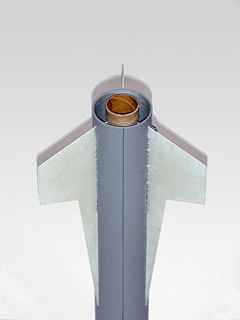 Facing the airframe opposite of the fin to be aligned, place the fin in the fin slot. Close one eye and visually align the three elements in a straight line. Repeat with the other fins. Tip: It helps to place dots at the base of the airframe under each of the fin slots for additional visual reference points. Lesson 2: Installing Fins - John Coker's site.